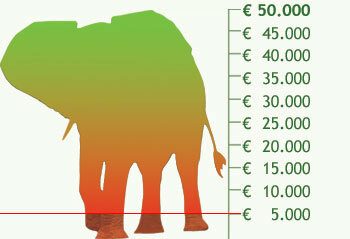 The adoption barometer for Shingwedzi stays at €2000. It seems like Shingwedzi wasn't very careful with her collar. In July 2004 she lost it, probably while she was scratching herself against a tree. Because the collaring is a very hectic procedure, the Peace Parks Foundation decided to leave it like this. Shingwedzi is spending a lot of time with Molly, so we still know how she is doing. Shingwedze's family is made up of another adult cow, two elephants around 10 years of age, and three elephants younger than seven. Molly is also currently spending time with her herd, but it doesn’t seem a permanent arrangement. Shingwedzi seems to enjoy a more sedentary life to the other elephants as she certainly moves around less than them on the whole. Although earlier in the year she did go on a weeklong trip to South Africa. Shingwedzi lives in the Great Limpopo Peace Park, the best known Peace Park ever. The park links different parks in Mozambique, South Africa and Zimbabwe. The total surface area of this Peace Park is approximately 35 000 km2 (7 million football fields). GoodFund has raised over €276,000 for the Peace Parks Foundation. Thanks to the help of everyone who adopted an elephant they can use these funds for many purposes concerning the development of transfrontier conservation areas. With these funds, the economic development, conservation of biodiversity and regional peace and stability are supported.